To maintain the safety and sovereignty of the blessed United Kingdom of British Islands. To seek out and destroy enemies of the state without compunction, hesitation or mercy. To boldly repel all boarders, all aliens and any other filthy non tax paying scum we encounter. Somewhere south of Gibraltar, possibly that bit too close to Morocco. It’s the day. At sea. The midday sun is hot. Too hot. Hot enough to toast ship’s biscuits. Consequently, I have ordered chef to fill the starboard scupper with enough ship’s biscuits to treat the crew to a toasty ship’s biscuit party. Something they deserve this after this long, hard and dangerous deployment. Good for morale. It will make a pleasant alternative to toasting our marshmallows with ship’s welding gear. I am baking on the bridge of HMS Rigid. I think my muffins will soon be ready to come out of the oven. I am also very hot. Sticky with sweat, especially in the underpants area. I am forced to adopt the bowed, legs slightly apart stance, as promulgated by naval regulations. This avoids unwanted scrotal sac adhesion should an emergency arise. The muffins are needed for an unscheduled top secret briefing from Vice Admiral McDuffear, Royal Naval Intelligence, Hunt and Destroy Division. No doubt with sealed orders. Orders that will, no doubt, require myself and my men to be put into danger. Deadly danger, I have no doubt. Pleased to note in the log that despite the heat, Petty Officer Tongs and Midshipman Stonkly are up the fo'c'sle, lashed at their stanchions and ready to repel all boarders. But wait. Who approaches? Is it the enemy? No. It is Able Seaman Blowpipe with my cocoa. Just wound it up, sir. Sorry about your cocoa, sir, I dropped the watch into it, sir, and it’s gone a bit brown. You blundering jackanapes, Blowpipe. What if Vice Admiral McDuffear wants to know the time? I can hardly show him this, can I? No, sir. It will look like you did a number two all over it, sir, and forgot to wash it. Number Two? Officers don’t do those, Blowpipe, you blithering idiot. No. He’ll more likely think you were the person that did it and you’ll get fingered. Oooo. Sorry, sir. I was distracted, sir. I think it’s the heat. I was wondering why, on a hot day, sir, all the flies gather in the middle of a hotel lobby, buzzing around the lamp. I mean they could go anywhere, couldn’t they, sir? And yet, there they are, mindlessly buzzing about, banging each other. You could open your mouth, walk forward and get a gob full, sir. Shut up, Blowpipe and stop dreaming about putting your mouth near flies, for heaven’s sake. You’ll need to keep your wits about you in front of Vice Admiral McDuffear. He’s as sharp as Cleopatra’s needle. Sharp, sir? With a name like that I assumed he was deaf, sir. What? You insubordinate scoundrel. Deaf? Of course he’s not deaf. Blind as a bat, though. Attention on deck. Pipe him aboard. Right, here he comes, Blowpipe. Now pay attention and refrain from any more fly related fantasy. Admiral McDuffear, welcome aboard. Attention on the bridge. Stand easy. Nice to see you again, Thundertosser. Ah, excuse me, Admiral, that’s the bridge port hole. The Rear Admiral is over here, sir. Course he is, course he is. Blast these new glasses, can’t see a bloody thing. Bringing up the rear, Admiral, manning the bridge oven. Excellent. Are those muffins I can smell, Thundertosser? Chocolate chip muffins? They are Admiral, I thought I’d whip up a batch. I know how partial you are to a stuffed muffin. Are you sniggering, Blowpipe? No sir. Bit of grit. In the eye, sir. Damned nuisance. Grit getting shot in the eye. Happened to me twenty years ago while on a reconnaissance mission in a French brothel; never recovered. Still never mind that, down to business. Now, Thundertosser. Bit of a flap on. Whitehall. Top secret orders. Storm cones hoisted. Man the battle stations. That sort of thing. Yes, Admiral. HMS Rigid is standing by; ready to repel all boarders. Ah, yes, but these particular enemies of the state are slightly more, how can I put it…unusual? Out of the ordinary, so to speak. Not your common tax evading immigrant scum from Europe, then? Ah, no. Not to put too fine a point on it, these are alien invaders, Thundertosser. Ministry gave me this book to help you locate them. What does it say, sir? ‘The Observer’s Book of Pokemon-Go’, Blowpipe. Correct, Thundertosser. Alien invaders. An absolute menace to the British way of life. They must be hunted and exterminated. But I read recently that Pokemon-Go helped nerdy inner city slugabeds become more active in the real world. They actually started to interact with other members of the public. That it was good for fitness and helped the socially maladjusted, sir. Begging, your pardon, sir. Nonsense. A tissue of lies and deceit spread by enemy agents from Lichtenstein and Poland. They must be destroyed and I’m deploying this ship to seek and destroy, as of now. 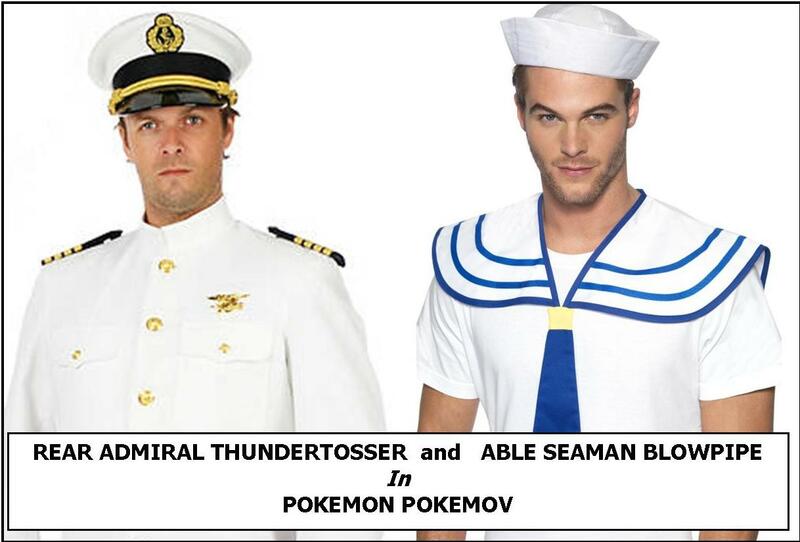 These Pokemon are public enemy number one as far as the First Sea Lord is concerned. Yes, shut up, Blowpipe, you insubordinate wretch. How do we start, Admiral? Is it in this top secret book? How should I know? I can’t bloody read with these glasses, can I? Thick tail? I don’t like the sound of that at all, Blowpipe. Me neither, sir. I prefer long and thin, sir. Oh my word, sir, it says that Nidorino has a horn harder than a diamond, sir. And I don’t like the sound of Sandslash one little bit, sir. What the blazes are you blithering on about, Able Seaman? Those are land Pokemon, for heaven’s sake. 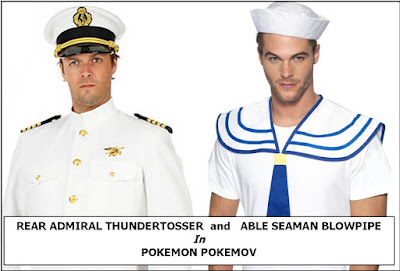 We’re only likely to encounter the seafaring types, such as Poliwhirl, Tentacruel and Kingler. Oh, that’s a relief, sir. They sound much nicer. Yes. All they do is emit a wet, slick, slimy fluid. Shut up, Blowpipe, you mutinous moron. Now, Admiral, how do we locate these alien scum? It is most difficult because they’re alien shapeshifters. We have to turn on our mobile phones and wave them around a bit. I suggest over there. At that Russian frigate that’s bearing down at top speed with its guns trained on us. You’re right, Admiral. There’s a Tentacruel on their quarterdeck, right now. Blowpipe. Hard a-port. Ramming speed. Stand by to open fire. Hard a-port it is, sir! Ramming speed! Sorry, sir. Just trying to disentangle my legs from this Russian block and tackle, sir. Can you smell burning muffins, sir? Right you are, sir. Do you think the Russians will complain, sir? How should I know? Rear Admiral Thundertosser raised an Italian flag at the last moment. That should do the trick. Who was in command of that Russian frigate, sir? Counter Admiral Sergei Blindokov, I think. Isn’t he as deaf as a post, sir? Yes. Excellent eyesight, though; he will have spotted that flag no problem at all. What is it now, Tongs, you blabbering fool? Pikachu, sir. Just hovering above the water, sir. Port side.